South Carolina SC Facts & Firsts SC State Symbols SC State Stone The South Carolina State Stone, Blue Granite, is unique to the Midlands and the Piedmont region of our state, where granite can be found in abundance. When the bill designating this symbol was passed in 1969, legislators declared that it had been used "to beautify all areas of South Carolina" and was thus the most appropriate choice. 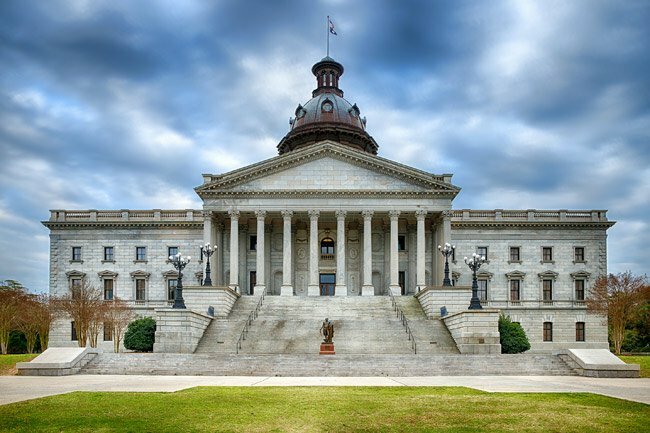 It was even used in the 1908 construction of the South Carolina Statehouse, pictured below. Often referred to as Winnsboro Blue Granite or simply Winnsboro Blue, this light-blue or gray-colored stone was quarried in Fairfield County between 1883 and 1946. Granite is an igneous stone, meaning that it was formed when magma (or molten rock) was trapped beneath the surface of the earth. There, it intermingled with other stones and particles (in this case, flecks of mica and quartz), cooling very slowly and then crystallizing. Granite has many uses beyond that of kitchen tile and counter tops. Granite blocks with irregularities can be used in the construction of coastal jetties, which help prevent beach erosion. 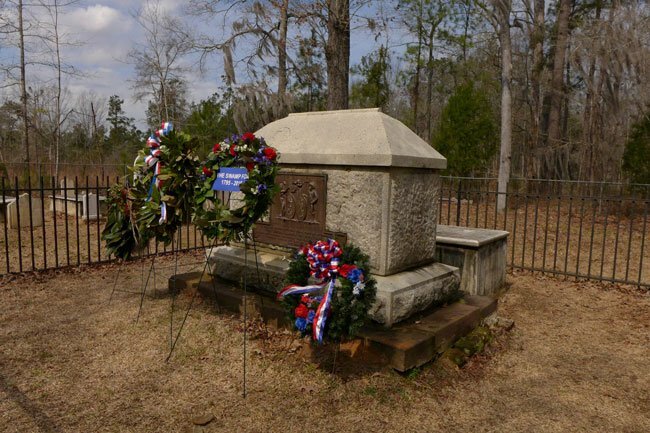 Granite is also cut into blocks for curbstone and building facing as well as carved into monuments, such as the grave monument for General Francis Marion pictured here. A 1909 document from the Board of Public Works of Charleston reported that more than 28,000 linear feet (5.3 miles!) of granite curb were placed along its streets that year. Another 12,000 square yards of granite block were used to pave Charleston streets in the traditional cobbled style. 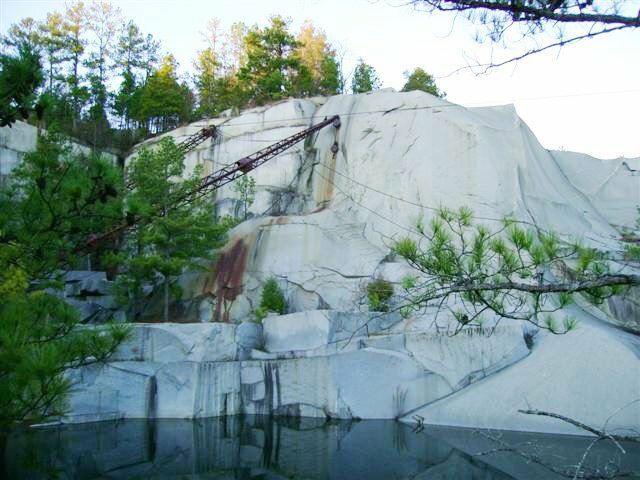 South Carolina has historically been one of the nation's top producers of granite. Granite weighs approximately 180 pounds per cubic foot, so transporting it by rail is the most efficient means. The Rockton and Rion Railway, based in Fairfield County, allowed large quantities of stone to be transported all over the country, where it was then used in building construction. Buildings from Columbia all the way to Philadelphia were built from the stone mined at the Kincaid-Anderson Quarry, pictured below. Local granite companies and the Rockton and Rion Railway made it possible for this small farming community to jump headfirst into the Industrial Revolution. A 1893 publication by Clinton-native Thornwell Jacobs describes South Carolina's State Stone as "the silk of the trade." A prized stone, it was used in the 1912 construction of Songbird Manor, the first home in Fairfield County to boast an indoor bathroom. Prior to the mine's official operation, this beautiful stone was used in the 1803 construction of the Little River Church, located only a mile from the modern quarry. The foundation, steps, and even the fenceposts were all carved from blocks of Blue Granite.